Depending on what…or who…you consider beach critters, this should be an interesting topic. Upon the arrival of summer and hot weather, various bums do emerge on sandy or rocky beaches. Trying to decipher which ones are harmless and which ones to stay away from is the trick. Here are a few tips about natural beach life and what to avoid! Sandy beaches have jellyfish. Jellyfish are usually just a nuisance, but can sting and require some first aid. Even if a jellyfish comes to rest on the beach, it can still sting. 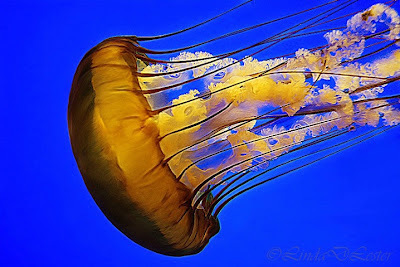 Jellyfish just look like a blob to me but apparently have tentacles. It is these tentacles that cause the sting and subsequent welts and rash. The best treatment is to use available natural resources where you are for treating the sting. Use some sand to grab hold of and remove any tentacles, making sure to dispose of them completely. Then on the area of the sting, rinse with seawater and, if you happen to have some vinegar handy apply it to neutralize the sting. If a more sever rash persists, consult a nearby first aid station for further medical care. Check out those mounds of seaweed left by high tides. Now there you can find all sorts of intriguing critters. As you carefully spread out the mass of tangled ribbons, watch crawling things emerge. A couple of tiny little red bugs, some awful pretty huge flies, some beetle looking things, and some bugs I found out later are pillbugs. Pretty annoying things on the whole, but at least they are not homeless after the tides dump them on the shore. Walking along the beach you are sure to find myriads of shells. On rare occasion you might even find whole ones that appear so perfect it’s almost like they washed up there just for you to discover. Inside the shells is a smooth, pearly lining; the sand and microscopic creatures rub the inside making it almost silky smooth. A few other critters along the beach, depending on which beach, are spider crabs, sand dollars, and star fish. The spider crab does not bite, is really fun to watch, and are harmless. Those delicate discs on the beach, sand dollars, mix in with shells so when children find them you hear eruptions of squeals. And no beach is complete without starfish. Usually by the time we find them they are dead, displaying their rough, but distinctive exterior. A couple of outstanding websites feature incredible sea life. Of course the National Geographic is one of the best. And from North Carolinawhere I have experienced some of the sea life mentioned, is this one. For a visit to some of our rocky shores, you might want to explore California. I always think of coral reefs when mention is made of rocky beaches. Some of our beach critters have habits resembling other beach bums. Some sting, some are just downright annoying, some are silky smooth inside a hard exterior, and some are harmless even though they look like the kind that could bite. Wonder if any of your beach critters are at all like these? Heather Fawkes is a marine biologist and writer who loves to cover ocean life as a topic. She frequently takes vacations to the Bahamas to get a closer look at some of the available wildlife.